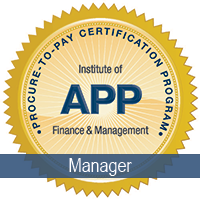 What is the IOFM Procure-to-Pay Certification program? With over 25,000 certified financial operations professionals worldwide, IOFM’s rigorous certification programs set the global standard for excellence in the accounting profession. IOFM's P2P Certification program is designed to equip both procurement and payables leaders and their staff to think end-to-end, to analyze and redesign their current processes, and to introduce and manage change. Is P2P Certification right for you? Whether you want to support your organization’s evolution toward P2P, or you want to optimize your existing P2P process, this training will give you and your team the resources and knowledge you need to become a leader in your organization’s advancement toward achieving a true end-to-end process. Available entirely online and on-demand, the program includes a comprehensive study guide, a 6-hour training video, a practice exam, and a 90-minute, 100 multiple-choice question exam (each candidate has up to three attempts to pass). Certification is maintained by earning 15 Continuing Education Units (CEUs) annually, keeping you up-to-date with latest in P2P best practices, compliance and technologies. Need help justifying certification to your employer? Download our Justification Letter. Unsure of which program is right for you? Review the certification career guide now! What do you get with your certification program? Your certification program comes with a study guide, training video and 3 attempts at the exam. You have one year from the day you enroll to complete the program.